Chicken Parmesan Zucchini Boats stuffed with lean ground chicken, tomatoes, and melted mozzarella cheese are a healthy and low carb meal that your whole family will love. 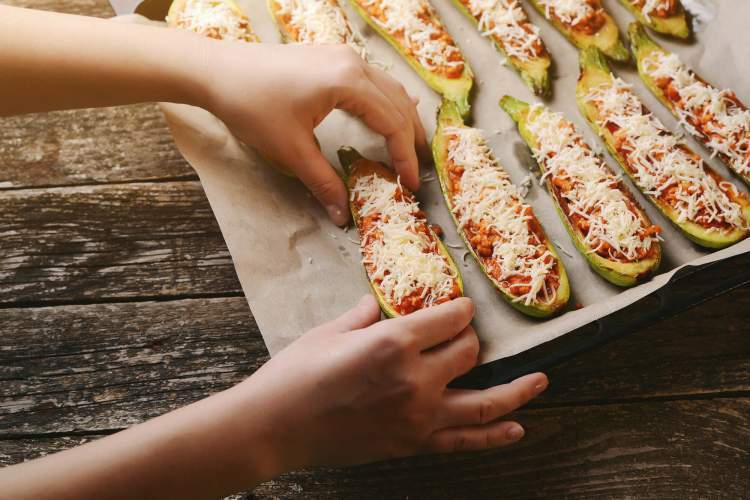 These Zucchini Boats with a chicken parmesan inspired filling are healthy, super tasty, and will satisfy any craving for chicken parm. They are one of our favorite zucchini boats along with these Zucchini Pizza Boats and Turkey Fajita Zucchini Boats. 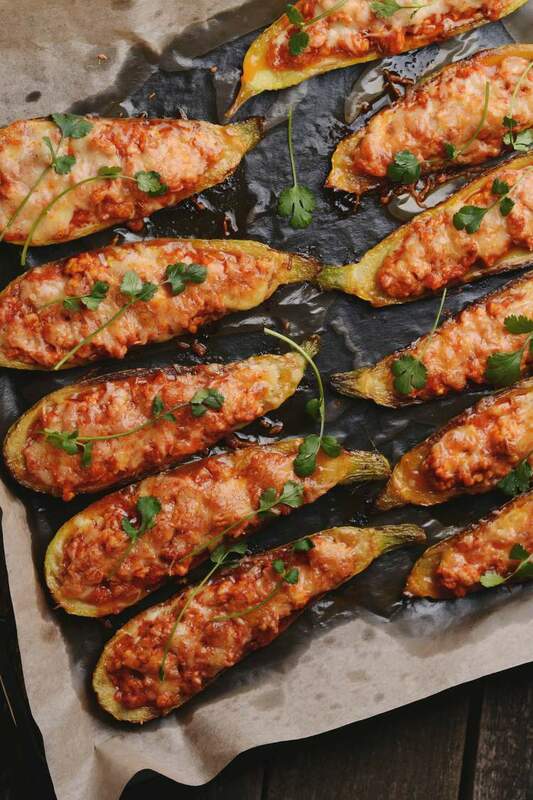 Zucchini boats are a popular option that any healthy eater should have in his or her meal rotation. They are low carb, figure-friendly, and if you leave off the cheese they work for Paleo, Keto, and clean-eating diets as well. I have found though, that the people who love zucchini boats the most are the ones you’d least expect. You know, the ones that won’t touch a vegetable, much less zucchini? I’m talking about you, kids, significant others, aunts, friends, and family members, etc. When you top zucchini with lots of yummy ingredients, such as sauce and cheese and chicken like I did in this recipe, I’ve found you can get almost anyone to eat zucchini. The inspiration for this dish though, comes not only from my love of Chicken Parmesan and my love of zucchini, but also from you, my readers. I get a lot of comments about how to make the foods you love healthier, in particular for those foods you don’t want to give up completely, but need to figure out how to make them fit within your diet needs. I’m always happy to receive your comments, suggestions, and questions and try to tackle your needs. That’s why I’m here, after all! What Makes These Chicken Parmesan Zucchini Boats Healthy? Besides swapping bread for veggie and ground chicken for breaded chicken, the ingredients themselves are nutritious for you, too! Zucchini is full of fiber and is also a low-calorie, zero-fat, and zero-cholesterol vegetable. It’s a great, versatile vegetable substitution for breads, grains, and pasta in a lot of dishes. Olive oil is a heart-healthy oil that’s great for cooking all types of foods. The kind of fat that it contains is monounsaturated, which means it won’t clog your arteries. Lean ground chicken is a great source of protein, and is generally lower in fat and calories than ground beef. Be sure to check your labels before purchasing to be sure. Onions contain high levels of antioxidants, folic acid, fiber, and B vitamins and are great for cell regeneration. Garlic has antibacterial and antiviral properties. It’s also great for your blood, blood pressure, and for regulating your cholesterol levels. Tomatoes contain lycopene which is an antioxidant that prevents free radicals from damaging your cells. Eating tomatoes is linked to a reduction in heart disease and cancer risk. They are also a good source of potassium, folate, vitamins K and C, and fiber. Basil and oregano are great spices (like so many others) for adding tons of flavor without adding calories, fat, or salt. Part skim mozzarella cheese is full of protein and calcium and is a lower-fat and -calorie cheese that’s great for baking. These boats lend themselves to all sorts of sides. I have served them with grains such as rice, brown rice, quinoa, and even millet. Couscous is another great option and you can often find pretty healthy box mixes for couscous that have great flavors as well. 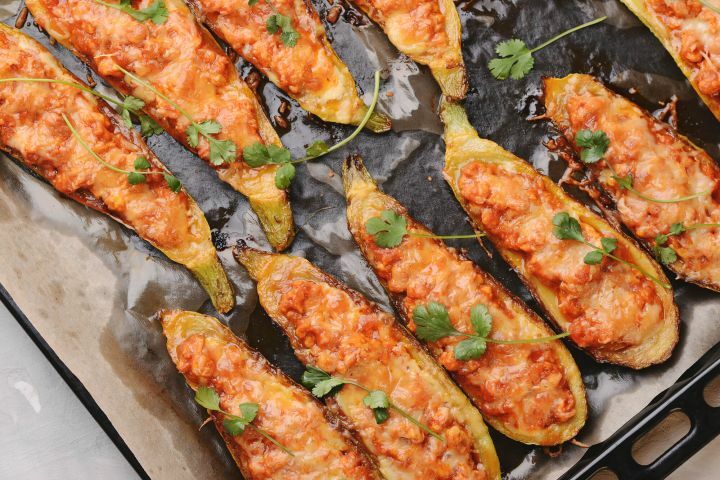 Serve these veggie boats with a side of more veggies if you’re feeling ad-veg-turous! Roasted Brussels sprouts, green beans, cauliflower, and broccoli all go great on the side. Salads, such as this Healthy Kale Caesar are my all-time favorite sides to go with just about anything but especially anything chicken parm. You could also whip up any kind of side salad you like using pre-bagged greens or even the bags of shredded kale and Brussels sprouts mixes go great with just about any healthy ingredients. Just watch your dressings — a lot of them can make that healthy salad not-so-healthy after all. Fruit also makes a great side. I think a lot of us get stuck in the rut that fruit is only to be served with breakfast or in our lunchboxes. That’s not true! Take a look at your fruit bowl the next time you are making dinner and get creative. Whip up a fruit salad using what you have on hand, or eat just one fruit by itself. Purchase a premade berry fruit bowl at your grocery or slice up wedges of watermelon or cantaloupe to add to your plate when melons are in season. As far as ingredients, you could use lean ground beef or pork in this dish instead of chicken. Add in mushrooms, white beans, or black olives for more flavors and textures. You can leave the tomatoes out if you want your boat to be a bit drier or add thin tomato slices to the boats before baking. You could also make this dish vegetarian by substituting a very firm, pressed tofu or seitan scramble or just using white beans or chickpeas. How will you have it?